If you missed Yesterday's introduction, this review is the second of three in a back to back barrage of reviews coming at you from Victoria's Alpine region. One yesterday, one today and the finale tomorrow. Be sure to check them all out! Ahhh the Snowline. If I had a dollar for every time someone recommended me the Snowline I would have, I dunno ... What's 2 or 3 bucks a week for the last seven years? 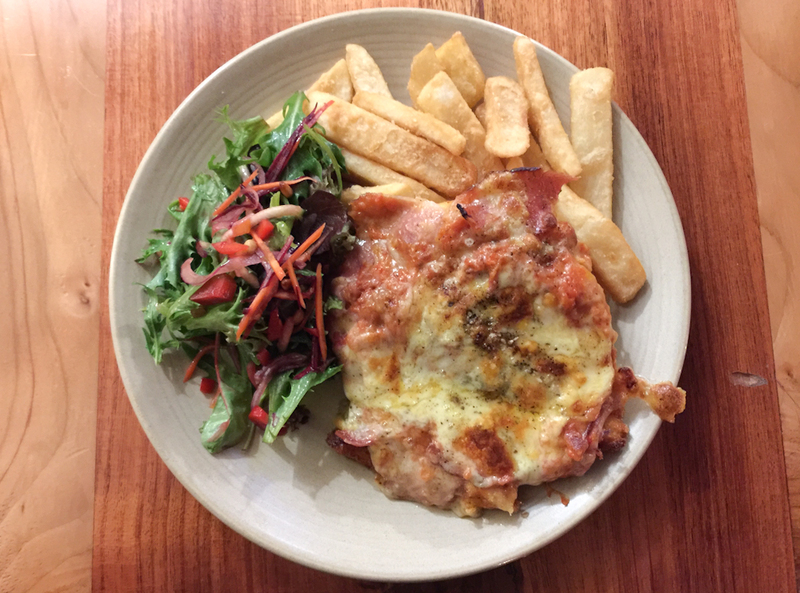 Behind the Toolshed in Noojee it is without doubt the most recommended parma we've had. It always held near-top position on the now not-sure-if-it's-still-being-updated parma.com.au, and to be honest this was the pub I was most excited about visiting during our weekend away to the Alpine region. Expectations could not have been higher. Lets see how it did. Every time I heard about the Snowline in the past it was always referred to as the "Harrietville Snowline", so much so I thought that was the name of the pub, imagine my surprise when I saw the signage that it was just the "Snowline" and the "Harrietville" is just where it was, kind've like how I always thought the pub at Melbourne Central was the "Melbourne Central Lion Hotel" and not the "Lion Hotel" that happens to reside in Melbourne Central. I'm not very bright. The weather wasn't as kind to us on our visit to the Snowline as it was on yesterday's trip to Happy Valley, so rather than enjoy the sunshine we quickly huddled into the pub, snagged a table in the already quite busy dining area, and grabbed a menu. Sounds good to me! We quickly placed our orders. The pub itself is hard to describe. Picture a backpackers for skiers combined with the dining hall at a school camp you went on in grade 6 and you're halfway there. It's got a dimly lit, laid back bohemian vibe that is both inviting and super easy to get lost in. The Snowline isn't like any pub I've been to in Melbourne, and I liked it. After ordering I spotted a break in the rain and quickly snuck outside to the spacious deck to grab a pic - A shame that the weather wasn't better as this looked like a damn fine place for a drink in the sun. For a country pub, I would describe the beer list at the Snowline as good bordering on excellent. Options from Coopers, Bridge Rd, and the nearby Bright Brewery and others on tap, along with an expanded selection in stubbies if the tap list doesn't tickle your fancy. For a pub that was heaving with hungry customers I was surprised at how quickly our food arrived - Ten minutes wait and our meals fell before us. First up the schnitzel - It was big on the plate, but not "holy crap look how big this thing is". Real chicken breast that appeared quite thick but on closer inspection that seemed to be in part due to some liberal use of the crumbs - Not criminally over crumbed, but thick enough to irk me a little... Although we are up in the mountains, maybe the chicken just needed some extra layers. The dish was served piping hot and cooked well, The chicken could have been juicier, but it was full of flavour and quite enjoyable with or without the toppings. The toppings were a bit of a mixed bag. The Mt. Beauty ham was pretty damn tasty and laid on quite thick, just how we like it. Great coverage of flavoursome cheese (although a little oily in parts), that was grilled to golden brown perfection. The biggest disappointment with the toppings on the Snowline's parma would be the napoli - or lack thereof. It was somewhat visible when the plate hit the table but it was all but undetectable while eating the parma, to the point where I couldn't even tell you if it was good or not, if this was a grade 6 school camp I'd be marking the napoli as absent for the day. The chips were a marked improvement on Happy Valley's. We upgraded to beer battered this time around and these ones were actually seasoned. Although served a little cold, as if they had been cooked separately to the parma and plated up at serving time - they were crisp, in abundance, and a decent side to the parma. There is a lot of value in here for $25. All the ingredients used were top notch and applied liberally - Considering the price if this one is the same price I paid for yesterday's parma and it is a marked improvement on that one then I'd definitely be happy to shell out another 25 clams to have this one again. Might be a case of overblown expectations, but I was underwhelmed with the parma at the Snowline. I was more than hyped to be floored by this parma and burst through the doors singing its praises but ended up walking away thinking "Yeah ... That was pretty good I guess". The pub has an outstanding, fun vibe and is definitely worth stopping in on your way up the mountain, it's not perfect, but as long as you don't go in with sky high expectations like the ones I had there is a lot of good to be discovered here.